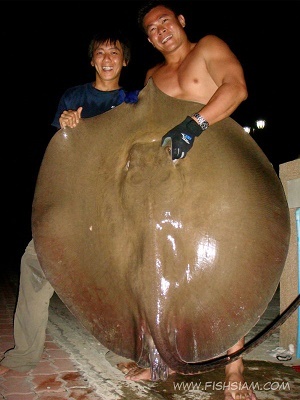 Boy guided two Singapore clients to the Maeklong River in Samut Songkran province to the Area 51 stretch of the river fishing for Giant freshwater stingrays. With nightfall approaching the anglers received an extremely tentative take whilst stingray fishing and on connecting with the unseen monster the anglers began an epic one and a half hour battle which saw them both tested to their physical limits! The unseen monster some twenty metres below doggedly hugged the riverbed and angrily powered off into the main flow of the river on numerous occasions. After what seemed like an eternity an extremely agitated Giant Freshwater Stingray surfaced alongside the angler?s boat dangerously whipping its tail against the side of the boat!